Sir Oliver and Lady Nugent’s youngest daughter, Constance, in 1892 married William Montgomery Gordon, a distinguished colonial servant who had served in Montserrat and at retirement was Assistant Colonial Secretary in Trinidad. The Gordon family hail from Brechin in Scotland and William graduated from the Edinburgh Academy, before taking up his first overseas post in the western Pacific. They married at St George’s church, Antigua. 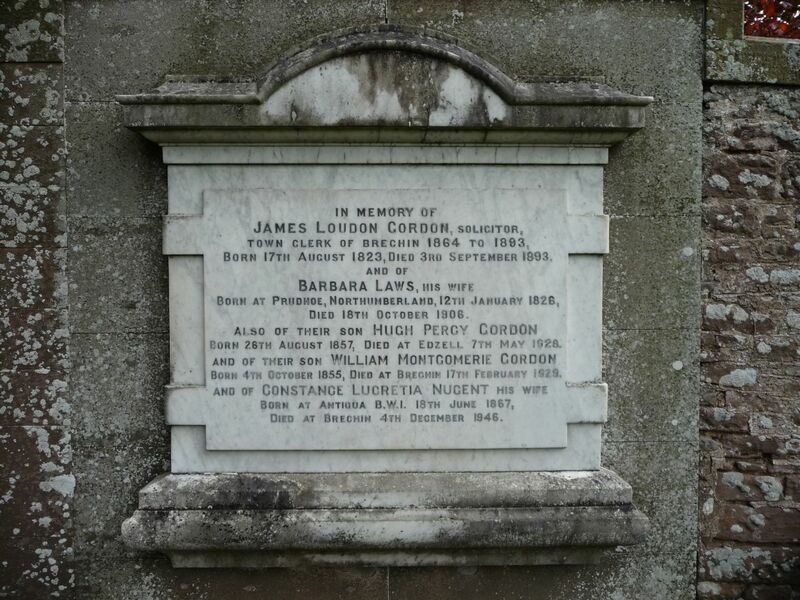 William and Constance Gordon had two sons, christened James Nugent and Oliver Louden, both of whom were born in Antigua. James was killed in France in 1915 during the First World War. Their second son, Oliver, became a hero in another way during the Second World War. He was Captain of HMS Exeter when she was sunk in the Java Sea off Surabaya on 1st March 1942 by Japanese torpedoes, an incident widely reported in the Antiguan press at the time. 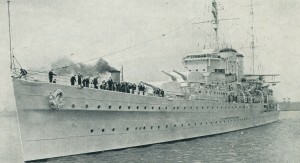 The vessel earlier achieved fame by out-gunning the German vessel Admiral Graf Spee in the Battle of the River Plate. Recently the wreck of the Exeter has been located off Java. 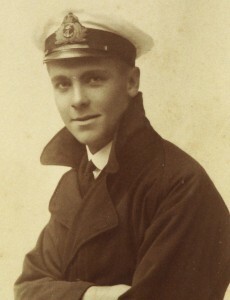 Captain Oliver Gordon was held prisoner by the Japanese for more than three years. It was reported in the London Times that, whilst a prisoner, he wrote a full account of the sinking and hid it from his captors in a tube of shaving cream. At any rate he subsequently wrote ‘Fight It Out’, a book about the episode which was published in 1957. Ahead lay two large cruisers with one or more destroyers: to the south, some fifteen miles away, were two other large cruisers in company with three or four destroyers. Our route to Sunda was blocked and there was nothing to do but fight it out. There was now no possibility of saving the ship, and to ensure that she should not fall into the hands of the enemy the order was given to sink the ship… At about 11.35 a.m., over the broadcast system (which was still working) I gave the order “Abandon Ship”. One quite senior Japanese officer was very scathing in his remarks to me at Macassar. He wanted to know why I was alive. When I explained that I had been picked up by one of their destroyers, he sneeringly replied in broken English: “Japan Captain sink with ship”, and turned away. Constance Gordon (née Nugent) died in Brechin in December 1946 (see gravestone, left). An obituary in a Scottish newspaper noted that Mrs Gordon’s sister, Miss Emily Nugent, lived at nearby Edzell, Scotland. Emily Louisa Turner, was born in 1866 and died unmarried in 1956. According to Sir Oliver Nugent’s will, Emily inherited the house in Redcliffe Street, St John’s, Antigua. The same obituary described Constance Gordon as “musically gifted”. Susan Jones writes: I am the great great granddaughter of Sir Oliver Nugent of Antigua, my great grandmother being Constance, his youngest daughter. I inherited scrapbooks and a large fossil and shell collection from Constance through her son, Captain Oliver Gordon, my grandfather, who was born in Antigua. 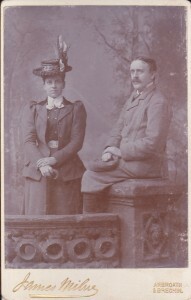 Constance and William Montgomerie Gordon (pictured right) had two sons, James and Oliver. 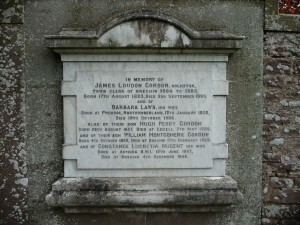 James was killed in the First World War. Captain Oliver Gordon CB MVO RN was navigating officer on the Royal Yacht Victoria and Albert from 1932-34 in recognition of which he was made a member of the Royal Victorian Order. He was Captain of the Exeter when it was sunken in the Java Seas in 1942 after which he was imprisoned in a Japanese prisoner of war camp for four years. 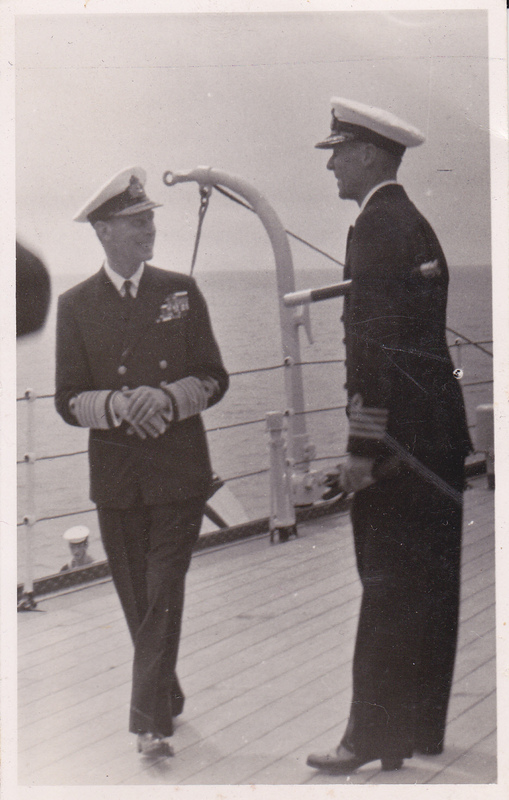 He commanded HMS Cleopatra from 1946 and was made Companion of the Order of the Bath in 1948. He was also aide-de-camp to King George VI with whom he appears in the picture below. 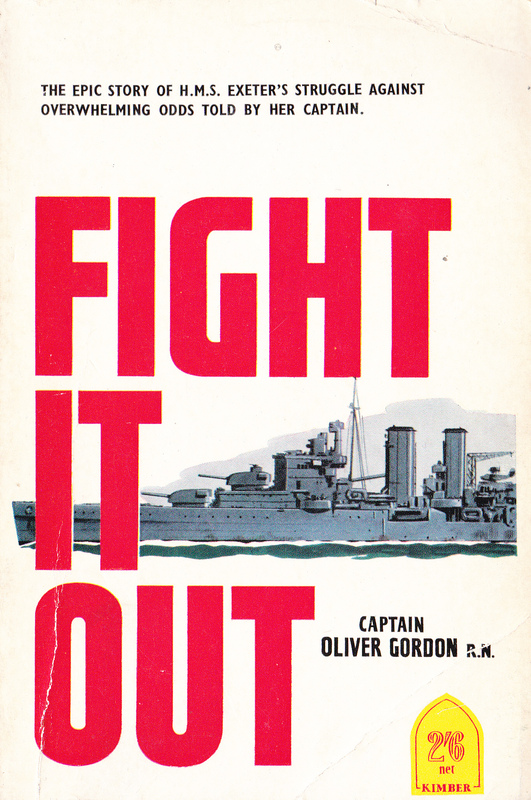 Captain Gordon’s account of the Battle of the Java Sea and subsequent imprisonment was published in 1958 under the title Fight it Out. He married Aileen Baker in Cape Town. They had two sons, James, who was tragically killed in a road accident in his 20’s, and my father, Charles William Gordon, born in 1927. It appears from the scrapbook that Emily Nugent, another of Sir Oliver’s daughters, lived with Constance in Trinidad and returned to Scotland with the Gordons around 1906. The scrapbook contains many photos of the family including the marriage photograph of Monica Nugent and Osbern Foster (see the ‘Scots Hill’ web page) and a newspaper clipping of the wedding announcement.